[John] is working on his PhD in experimental earthquake physics, and with that comes all the trials of becoming a PhD; tuning students into the cool stuff in the field, and demonstrating created after 1970 to his advisers. One of the biggest advancements in his line of work in the last 30 or 40 years is all those sensors you can find in your cell phone. The three-axis magnetometer in your phone is easily capable of measuring the Earth’s magnetic field, and this chip only costs a few dollars. To demonstrate this, [John] built a 3D compass to show off the capability of these sensors, and have a pretty light show for the undergrads. 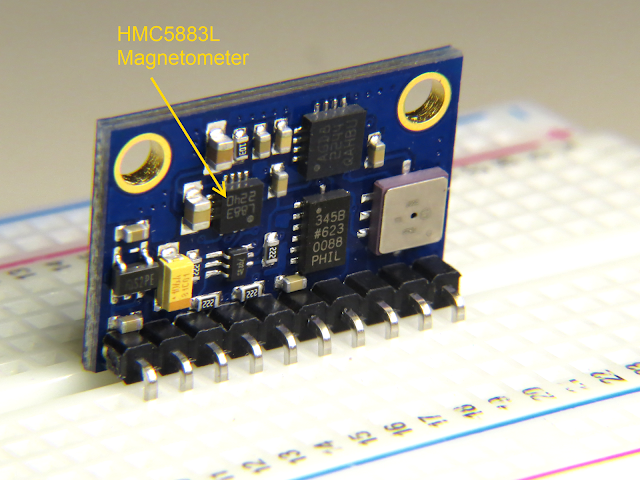 The magnetometer [John] is using is just a simple I2C magnetometer that can be found on Adafruit or Sparkfun. It’s not really anything special, but with a little bit of code, [John] can read the magnetic field strength in the x, y, and z axes. Having a microcontroller spit out a bunch of numbers related to the local magnetic field just doesn’t seem fun, so [John] picked up two neopixel rings – one inside the other, and set 90 degrees out of plane with each other. 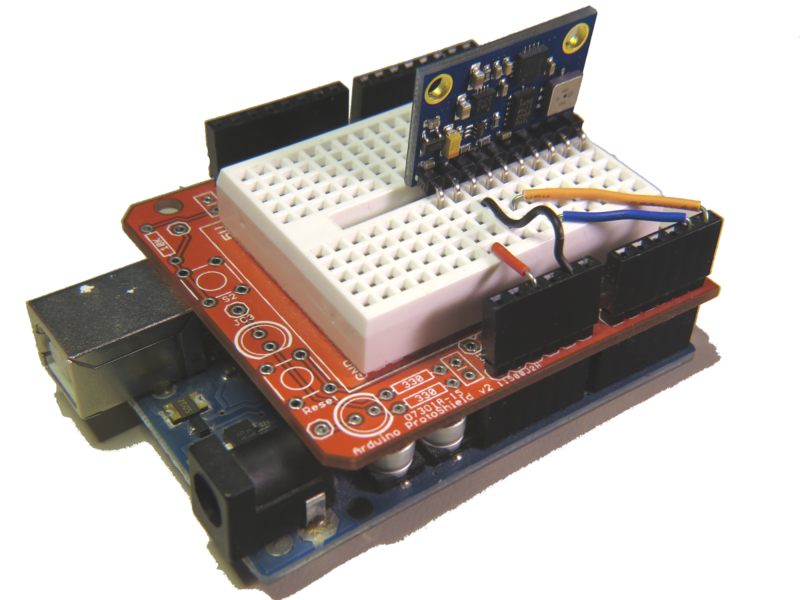 This turns his magnetometer and Arduino setup into a real 3D compass. With this device, the local magnetic field can be visualized in the x, y, and z axes. It looks cool, which is great for undergrads, and it’s a great demonstration of what you can do with small, cheap electronic sensors. [John] put up a screencast of a talk he gave at the American Geophysical Union meeting last year. You can check that out below. Today I had to write a program to fit a sphere to a bunch of points that were supposedly near the surface of a sphere, but were noisy and sampled in a very biased way. Since this is obviously not a new problem, I started out doing web research. but I didn’t look for fitting a sphere, but for fitting a circle, since that is a simpler related problem. I found a lot of papers, including several review papers, on how to fit a circle to a bunch of points. The “obvious” method is to do a least-squares fit to minimize the distance between the points and the circle, minimizing , where is the radius and is the center of the circle. Unfortunately, that is a difficult problem to solve, and even numerical methods require a lot of iterations to get decent solutions. What most people do is to change to a slightly different problem that optimizes a different fitness function. For example, Kåsa’s method minimizes . There is a very nice, but very formal, presentation of the methods in a paper by Vaughn Pratt from 1987: Direct Least-Squares Fitting of Algebraic Surfaces. This paper introduced Pratt’s method, which was later slightly improved to make Taubin’s method. I did not read these original papers (other than skimming Pratt’s paper). Kåsa’s paper (A curve fitting procedure and its error analysis. IEEE Trans. Inst. Meas. 25: 8–14) does not seem to be available on-line. The IEEE digital library is missing the whole 1976 year. This paper shows that Taubin’s method is theoretically superior to Pratt’s which is theoretically superior to Kåsa’s (having less essential bias), and gives a very weak example showing it is also tru empirically. More interestingly, it also gives a “hyperaccurate” algorithm that has less bias even than Taubin’s method. I did not read the error analysis, but I did read the description of their Hyper algorithm and the implementations of it that Chernov has on his website. Since I needed Python code, not Matlab code, and I needed spheres rather than circles, I spent a few hours today reimplementing Chernov’s Hyperfit algorithm. I noticed that the basis suggested by Pratt for spheres, , was a simple modification of the one used in both Pratt’s paper and Chernov’s paper for circles, . I decided to generalize to dimensions, and use the Numpy package in Python for all the matrix stuff. I hope I got the generalization right! From starting to look for papers until getting the code working was about 6 hours, but I had lunch in there as well, so this felt like pretty speedy development. I’ve released the code with a Creative Commons Attribution-ShareAlike 3.0 Unported License, and would welcome corrections and improvments to it. Of course, after all this buildup, you are probably wondering why I needed to fit a sphere to points—that is not a common problem for a bioinformatician to have. Well, it is for the robotics club, of course. They’ve been having a lot of trouble with the magnetometer calibration and heading code, so we decided to try doing an external calibration of the magnetometer, which has an enormous arbitrary 3D offset. By waving the magnetometer around in different orientations (which means tumbling the ROV once the magnetometer is installed), we can sample the magnetic field in many orientations, though far from uniformly. The center of the sphere fitted to the readings gives us the 3D offset for the magnetometer. My son and I tested it out with Python code and Arduino code that he had written to get the data from the magnetometer to the laptop, and the magnetometer readings do seem to be nicely centered around (0,0,0) after we do the correction. We’re still having trouble using the accelerometer to get a tilt correction to give us clean compass headings, but that is a problem for tomorrow morning, I think. Since I had bought the robotics club an I2C accelerometer and magnetometer, I decided to make a new PC board for them to mount the accelerometer, the magnetometer, and the pressure gauge on the same board. I don’t have the SMD soldering skills to solder all the chips onto one board, and I already had breakout boards for the accelerometer and magnetometer from Sparkfun, so I decided just to put connectors for those breakout boards onto the back of the pressure sensor board. (The back, because the pressure sensor on the front has to be stuck through a hole in the dry box and glued in place. The new boards are tiny (1.05″ × 1.425″), so I decided to try BatchPCB (which has pricing by the square inch) rather than 4pcb.com (which has fixed pricing per board, up to a fairly large size). The price from BatchPCB was $10 per order plus $2.50/square inch plus $0.90 for shipping, so ordering 3 copies of the board (though I only needed one), cost me $22.12, substantially less than a single board from 4pcb.com, which is $33 plus $17.30 shipping and handling per board (plus an extra $50 if your board has multiple boards on it). 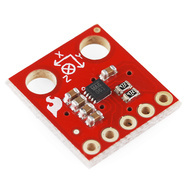 The 4pcb price is lower if your board is bigger than about 15.76 square inches, so even my HexMotor boards (at 12.44 square inches) would be cheaper from BatchPCB. If you get multiple boards from 4pcb.com on a single panel and cut them apart yourself, the breakeven point is about 35.76 square inches for a single design (so three HexMotor boards from a single 4pcb.com panel is cheaper than from BatchPCB). For multiple designs on a single panel, the 4pcb.com deal is better: for 3 different designs, a total of 27.04 square inches would make 4pcb.com the cheaper way to go. If you want a copy of the board, you can order it from BatchPCB, or pick up the Eagle files from my web site and order copies from elsewhere. I’ve put the HexMotor Eagle files on line also, but not put them on the BatchPCB site. I should probably upload them there sometime. Bottom line: BatchPCB is better for small numbers of tiny boards, but 4pcb.com is better for larger boards and multiple designs. The BatchPCB orders came back quite quickly (12 days from order to delivery by mail), though I had been worried because their design-rule check, which they say takes minutes had taken about 8 hours. The problem was that each check takes a few minutes, but they had hundreds in the queue over the weekend, and it took a full day to clear the queue. I had less trouble soldering the pressure gauge this time (this was my second attempt at soldering surface mount devices). You can see in the pictures above that the results are much cleaner than in my first attempt. The robotics club has tested the pressure sensor on the new board (using their own code on the Arduino) and it seems to work ok, have drilled the hole in the dry box for the port, and glued the sensor board in place using superglue. It seems to be waterproof (at least down to 1 foot—we’ve not tested in deep water yet). In Learning to Use I2C and Magnetometer not fried, I talked about interfacing the MAG3110 magnetometer and MQA8452Q accelerometer to an Arduino. For both, I’m using breakout boards from Sparkfun Electronics. I checked today that there are no problems when I connect both devices to the same I2C bus. The first test was very simple: I put both the breakout boards into a breadboard and wired them together, then tried running each of the programs I’d written for the chips separately. Result: no problems—worked first time. I think I’m now ready to hand over the software to the students to use for their robot. One thing that is still missing is doing tilt correction for the compass heading. Since the ROV is not expected to remain level (the accelerometer is intended to be used in a feedback loop to adjust the pitch, with anything from -90° to +90° being reasonable), getting a good compass heading requires rotating the magnetometer readings into the horizontal plane. Only one of the students in the robotics club has had trigonometry or matrix math, so I’ll have to work with him to get him to figure out how to do the tilt correction. It may be simplest conceptually to compute pitch and roll angles first, then rotate twice, rather than trying to do the whole tilt correction in one step (especially since the Arduino does not have matrix libraries). 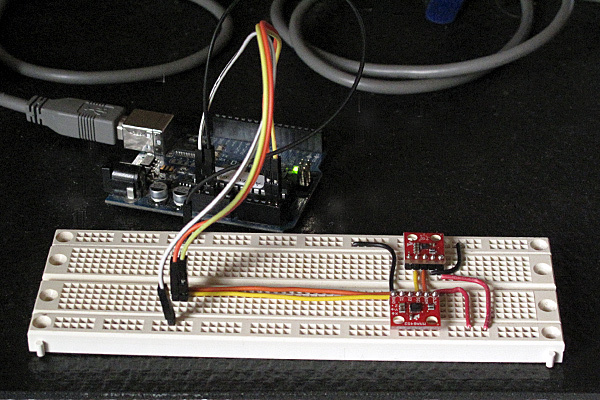 In Learning to Use I2C, I talked about the difficulty I’d been having getting the MAG3110 breakout board from Sparkfun to work, and my fears that I had burned it out by running it overnight at 5v (instead of the rated 3v). I suspected that my problem was really a software problem, but debugging the software when I was afraid that the hardware was fried seemed like an exercise in futility. I bought another of the breakout boards from Sparkfun (they’re only $15), and soldered on a header yesterday. The code failed in almost exactly the same way with the new (presumed good) part as with the old (presumed fried) part, so I was convinced that the problem was indeed in the software. I spent half of yesterday and most of this morning carefully rewriting the library of I2C interface code. I was starting with example code from Sparkfun for the MMA8452Q accelerometer, which I had generalized to handle other I2C devices. The library worked fine with the accelerometer, so I thought it was ok, but it did not work with the magnetometer. I added a lot of error checking (making sure that the microprocessor was in the expected state after each I2C operation), and found that things were not working as expected. The extra error checking made it much easier to diagnose the problems. I had to re-read the I2C documentation in the ATMega328 datasheet several times, to make sure that I had all the details right (I didn’t, of course). The documentation in that data sheet is better than several of the tutorials I’ve seen on line, and is both thorough and comprehensible in describing the interface. I did not implement all features of the I2C interface—in fact, I have a rather minimal implementation that uses polling rather than interrupts and assumes that the Arduino will always be the bus master. Those assumptions are fine for most Arduino projects, which just use the I2C bus for talking to a handful of peripherals, but sometime in the future I may need to make a more complete set of code that can handle multiple masters, the Arduino as a slave device, and interrupts rather than polling and waiting for operations to finish. Because I was more interested in simplicity and robustness than speed, I rewrote the code so that transactions were finished (and appropriate status checked) before functions returned. With these changes I found that the STOP condition was not happening, despite being requested. All other operations on the bus are checked with the TWINT bit of the TWCR register and the upper bits of the TWSR register, but determining that STOP has completed requires checking the TSWTO bit of the TWCR register. The code I had started from just checked the TWINT bit for the other operations, and had a fixed timeout that was too short—it did no checking at all on the STOP state, just adding a fixed delay. Once I got the STOP timing cleaned up (and earlier, making sure to send NAK when reading the last byte), everything worked fine. The accelerometer code had probably worked ok because there were enough delays after stops that the stops completed, even though I had not checked to make sure. With the fixed code, even the magnetometer that I thought I had fried seems to work ok. I suppose I should check that there are no problems when I connect both devices to the same I2C bus, before handing this over to the students to use for their robot. I should also put the i2c.h and i2c.cpp in some public place for others to use (perhaps on github? maybe on my web pages at work?). It is really a shame that WordPress.com does not permit code-like files as pages.